Industrial Schools were set up in Scotland after an Act of 1866. They were intended to care for abandoned and neglected children, prevent them from becoming involved in crime and to teach them a trade. 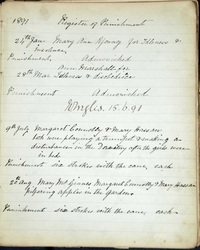 Here we see records for two girls who attended the Snowdon School in Stirling in the late 19th century. ‘girl is left without guidance or control and falls into all sorts of wrong doing’. Mary Hussan who was 8 when she came to the School in 1890 has lost her mother and is also described as ‘staying out at night keeping bad company’. Although the conditions in industrial schools could frequently be harsh, they did at least offer children a place of safety and a chance to behave as children as we see from the punishment book below. 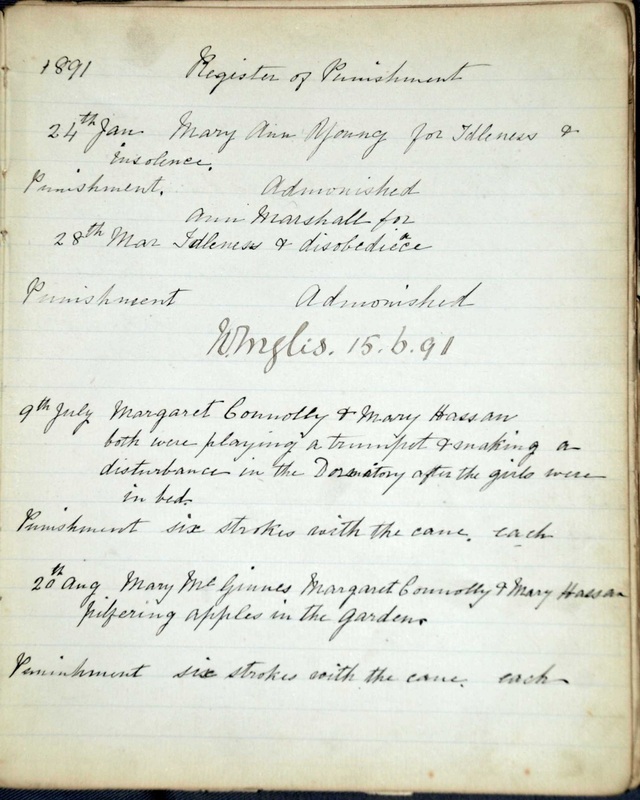 Margaret and Mary are punished for making a noise with a toy trumpet in the dormitory at night in July 1891 and later Margaret was caught ‘pilfering apples’ in the garden. The punishments seem extreme but are normal for the institution at this time. Later in the same volume, the administration of the School appears to change as the nature of punishment is more likely to be not being allowed to have jam at tea or being sent to bed early."